Last year, Victor LaValle wrote one of my favorite books of the year (The Ballad of Black Tom—which I reviewed here) and he also has written one of my favorite novels of all time (The Devil in Silver). This year, he tackled a novel based on one of my favorite fairy tales. 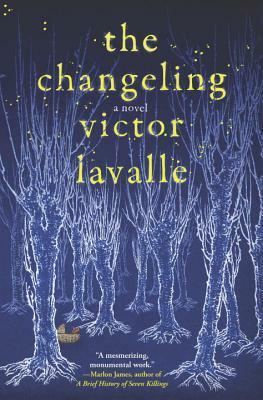 Basically, I was pretty damn excited for The Changeling. The Changeling reimagines the changeling stories—updating them to modern day New York and focusing on the father of the baby (the majority of variants I’ve read of this story have focused on siblings and mothers). The father, Apollo Kagwa, nurses the memory of his own disappeared father and is determined to be a father who stays and who protects and cherishes his own child—baby Brian. Apollo’s wife is the strong-willed Emma, who seems to be suffering from a severe post-partum that is making her a stranger to herself. When she does something horrifying (and it is horrifying enough that I had to set the book down for a bit after reading that part, so be warned), Apollo must reevaluate everything he knows about his wife, his life, and his child. What LaValle does amazingly well here is in his weaving of fairy tale qualities subtly into the story—the slight bits of magic that edge through the reality, the storyteller’s voice occasionally shifting to a chattiness directed at the reader, the way characters tell stories to each other within the larger story. This book is both a story that feels like a fairy tale should and like a beautifully imagined and realized novel, a harder balance to find than most books manage to do. Done as equally well is the blending of the modern and the ancient—where magical islands can exist next to iPad apps and Starbucks can play a critical role in a quest. Instead of reading like a gimmick, these moments feel true to the story and world that LaValle has so lovingly crafted. One other thing that must be mentioned is how much this is a book for people who love books and stories. Maurice Sendak’s Outside Over There (a book I read so much as a child that I can still mentally go through the pages in my head) plays a crucial role and Apollo’s career is as a used book salesman (Emma is a librarian). This is a story about stories, about the power of narrative, about the truths we find there. If there are issues in the book, they are small ones. One moment has continued to confuse me days after reading the book (I’m not sure if it was a snarled bit of editing or if I missed something subtle—in which case, it was too subtle). The other issue is that it’s a book that begs to be read in one sitting, as a fairy tale should be told in one, but not everyone gets the chance to do that and taking breaks out of it make the pacing feel more ragged than if you can just breathlessly race through it. For this reason, though, it’s probably a book that will reward multiple rereadings when you can sink into the story and its mood. Ultimately, LaValle has done it again—crafting a gorgeously evocative book that brings up age old questions of family and love and sacrifice alongside more recent questions about privacy and technology. This is another book that is not to be missed and won’t soon be forgotten.